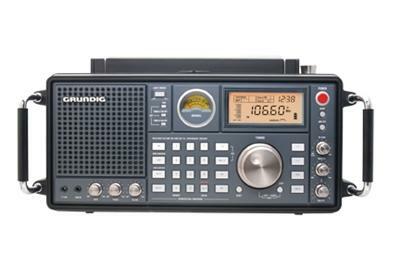 At last, a quality receiver with all the features you need, including full HF coverage and civil VHF airband. Within minutes of powering on, you'll be operating the Sat 750 with ease. The LCD display panel is clear and easy on the eye, and has a switchable backlight too. It has a great sound too, with independent bass and treble controls, and a good quality front-facing loudspeaker. The receiver has full coverage of HF from 1.7 - 30 MHz in AM/LSB/USB, Long wave band from 100 - 519 KHz, Medium wave band from 520 - 1710 KHz, FM band 88 - 108 MHz (stereo with headphones), and of course the VHF Civil Airband from 118 - 137 MHz in AM. A host of other user friendly controls include a handy signal attenuator, squelch, RF Gain, large VFO tuning knob, an S-Meter, and other nice touches like 2x BNC outputs for use with external antennas, a stereo line output, and wide & narrow filters fitted. Run the Sat 750 indoors from the supplied mains adaptor, or take to the hills and run it from battery power - just 4x D size batteries will give many hours of happy listening out in the fresh air! It's also fitted with a handy dual alarm clock function, and a massive custom 1,000 memory channels for storing all of your favourite stations... there's only one thing missing from the Satellit 750..............a big price tag!